As I mentioned, I’ve been itching to try making some recipes using chia seeds. I’ve been seeing them in all sorts of yummy recipes on Pinterest, from puddings to snack bars. I’ve been trying to find healthy snacks to eat when I get off work. Something with lots of nutritious ingredients that would get me ready to hit the gym. These bites were just the thing! Packed with all sorts of goodness, these energy bites are sure to fuel your afternoon. They are a snack I look forward to eating each afternoon, and the best part is they are guilt free. 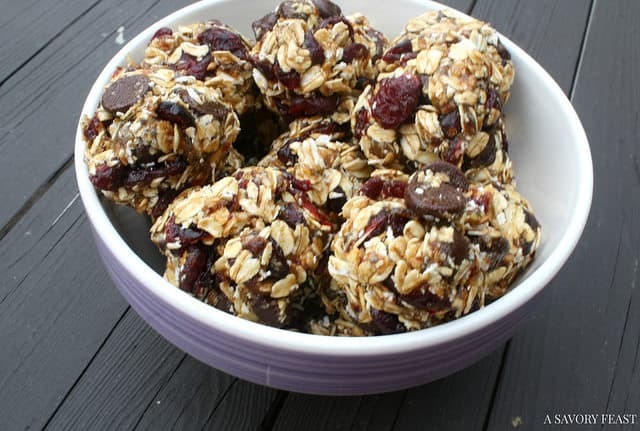 You can replace those expensive bars and snack on these energy balls instead. Make a big batch, they’ll last for up to 2 weeks in the refrigerator. Anytime you need a little pick-me-up you can grab a couple to munch on. This snack is so easy to make! It will only take you a few minutes to get everything mixed up. Put the mix in the refrigerator to cool while you get a few things done. Then roll them up and enjoy! 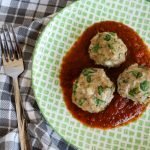 The beauty of this recipe is that it’s so easy to customize and change up. Try adding nuts, different dried fruits or anything else you fancy. These Chia Seed Energy Bites are so flavorful. I love how the dark chocolate complements the dried cranberries. 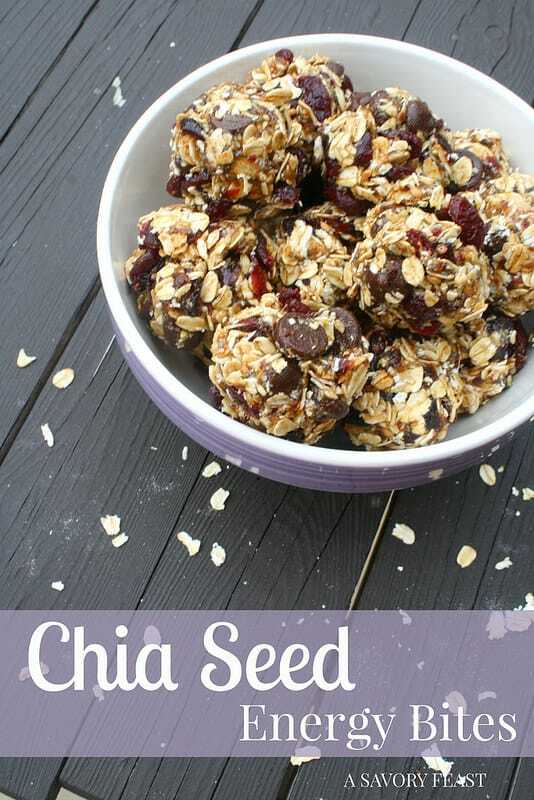 Add in the wonderful texture of the oats and seeds and you have a snack you will want to make again and again. Recipe adapted from Cranberry Pistachio Energy Bites from Gimme Some Oven. 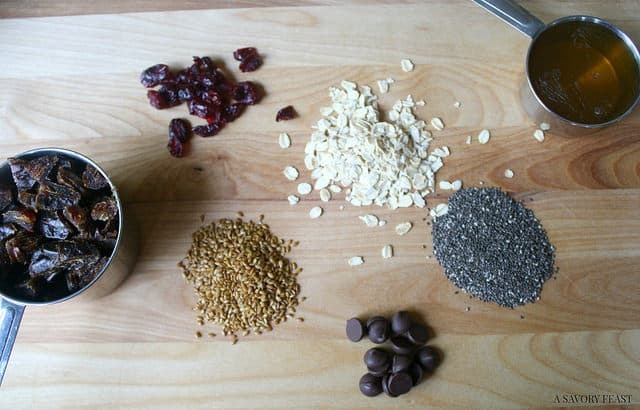 Put the dates, honey, chia seeds and flax seeds in a food processor and pulse until smooth and combined. The mixture will be thick but you should still be able to stir it. If not, add more honey. 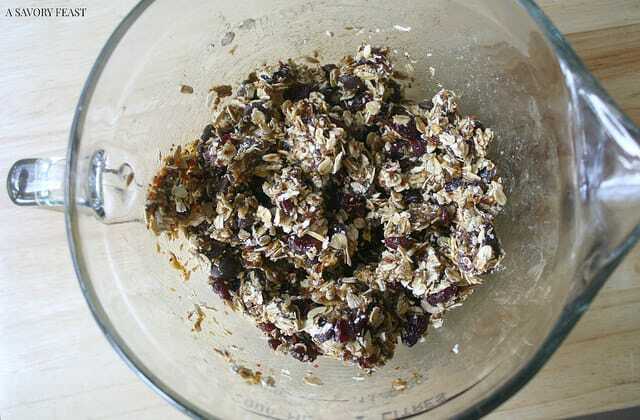 Pour the date mixture into a medium mixing bowl and add the oats, cranberries and chocolate chips. Mix well so that the dry ingredients are completely coated with the date mixture. Cover and refrigerate for at least 30 minutes. Take the mixture out of the refrigerator. It should be much easier to work with now that it is cold. Press the mixture into 1-inch round balls. Store the balls in the refrigerator for up to 2 weeks. 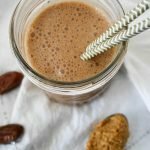 Join in the Chia Seeds Recipe Challenge! Now I’ve got an entire bag of chia seeds that I need to figure out how to use. 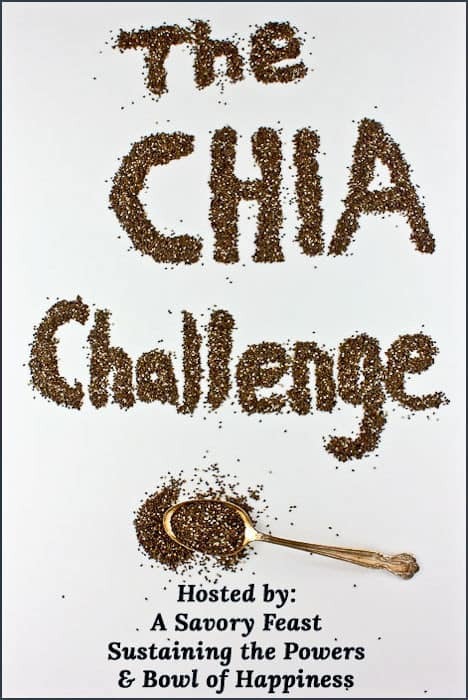 Join in the challenge with us and link up your chia seed recipes! Share an old post or create one this week to link up. Get Ready For Next Month’s Challenge! Our challenge for the month of May will be POPSICLES! To celebrate the beginning of Summer, break out your popsicle molds and get creative. Will you create a fruit popsicle? Chocolate? Or a unique flavor combination that’s never been made in popsicle form before? Start brainstorming and get ready to link up with us during the 3rd week of May. 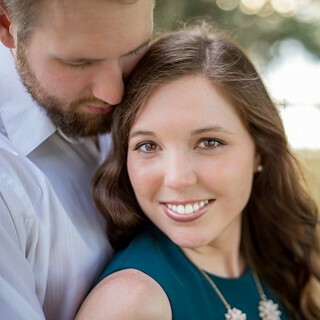 Previous Post: « $100 Target Gift Card Giveaway! These look so good!! I’d totally eat them for breakfast. I’m so excited to have new ways to use chia seeds. Thanks for doing this challenge with me! I did have them for breakfast one day! They were a great way to start the day. I may need to do that more often. Ahhh YUM! These look SO good. I just had one for a snack! They are sooooo yummy. Oh, these look delicious! And bonus, I think I have all these ingredients in my pantry. I might just have to make them when I get home! Perfect! You will love how easy they are to mix up, too. Can I leave out the flax? It upsets my stomach. Otherwise I am definitely going to make these! You could definitely leave out the flax! It only uses a tablespoon so it really wouldn’t make much of a difference in the consistency. You could always do an extra tablespoon of chia seeds instead. 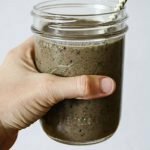 I love using chia seeds in my smoothies but I’ve never thought about doing something like this! 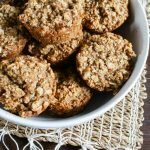 I made some energy bites once with peanut butter and oats, but I bet dates are so good! Chia seeds are my new favorite! I’m trying to find some new ways to use them. You should definitely try using them in these energy bites! Using dates instead of peanut butter is much better for you. I really liked how they tasted, too. It’s such a great combination of flavors! I’m sure you will love it. Yum! 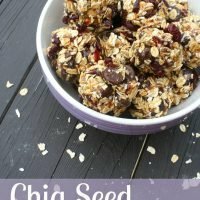 These are similar to some breakfast cookies I make from time to time, but I love the addition of seeds. I really need to pick some up and experiment! Ooh, I should make these into breakfast cookies sometime! I did eat them once for breakfast, and they were great. Oh my goodness, this is so fun! I love chia seeds. I normally put them in my salads but those energy bites looks delish & I cant wait to make them! I will definitely be linking up next month! Mmmmm, I am loving chia seeds right now! I’ll have to try putting them in salads. I’ve got a whole bag I need to use. I can’t wait to see your popsicle recipe next month! Chia seeds are so good for you! Thanks so much for sharing at Bloggers Brags this week. I’m pinning it to our board on Pinterest! Yes they are! I’m trying to find more ways to use them, and this was a great first attempt.